This interesting surname is of early medieval English and French origin, and is derived from the nickname for a brave or perhaps fool-hardy person, one who would risk all for ultimate success. It derives from the Old French, Middle English (1200 - 1500) "hardi", meaning bold or courageous. This surname is an example of that sizeable group of early European surnames that were gradually created from the habitual use of nicknames. The nicknames were given in the first instance with reference to a variety of characteristics, such as physical attributes or peculiarities, mental and moral characteristics, supposed resemblance to an animal or bird's appearance or disposition, habits of dress and occupation. 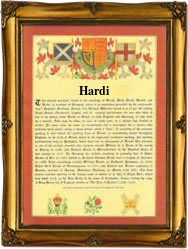 The modern surname can be found as Hardy, Hardey, and Hardie in England and Scotland, whilst it is usually Hardi in France. Examples of the surname recordings include William Le Hardy of Lincoln in 1206, and somewhat later, the marriage of John Hardy and Agnes Payce on November 11th 1563. At the church of St Mary Somerset, William Hardie married Margaret Bover on July 17th 1569. An interesting namebearer, recorded in the "Dictionary of National Biography", was Sir Thomas Masterman Hardy (1769 - 1839), who was the flag captain of Nelson in the "Vanguard" and "Foudroyant" (1799), in the "San Josef" and the "St. George" (1801), and in the "Amphion" and the "Victory" (1802 - 1805), on which Nelson died. He was made a baronet in 1806 and became a vice-admiral in 1807. The first recorded spelling of the family name is shown to be that of William Hardi, which was dated 1194, in the "Pipe Rolls of Yorkshire", during the reign of King Richard 1, known as "The Lionheart", 1189 - 1199. Surnames became necessary when governments introduced personal taxation. In England this was known as Poll Tax. Throughout the centuries, surnames in every country have continued to "develop" often leading to astonishing variants of the original spelling.